Like many countries throughout Europe, the Netherlands is facing steep declines in religious attendance, no matter what the faith. Many of the glorious houses of worship, numbering about 2,300, that used to open its doors to thousands of the faithful are now closed, facing uncertain futures and devoid of active worshippers and the funds to keep the buildings running. 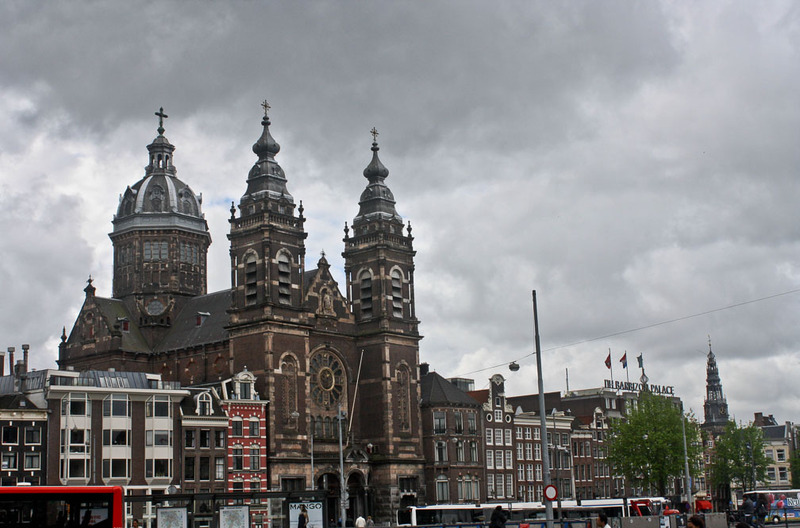 In Amsterdam, for instance, a synagogue has been transformed into a museum, a Catholic church into office space, a Protestant church into a diving shop. Those that remain, however, are simply stunning — a fantastic display of art, architecture, history, and religious belief systems scattered throughout the capital of the Netherlands. These are my favorites. 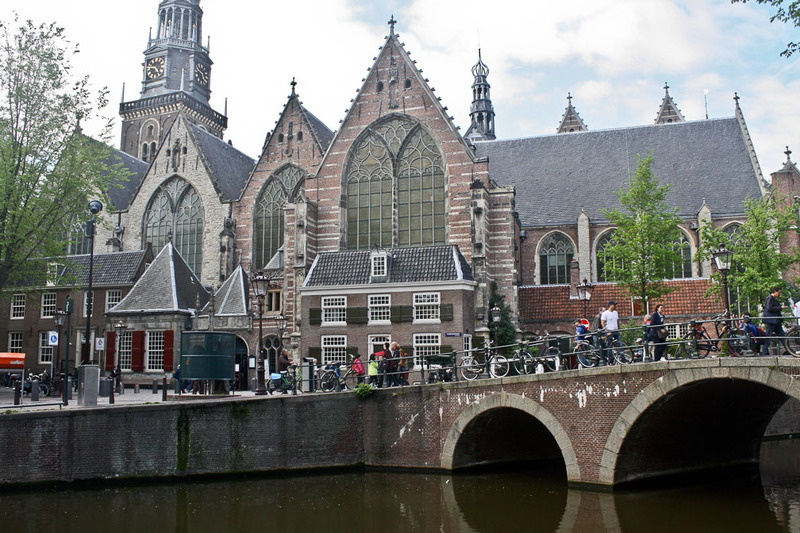 Constructed in 1306 as a Roman Catholic Church (and altered pretty much every century since), Old Church (Oude Kerk) stands at the heart of both Amsterdam’s medieval center and, somewhat inappropriately, its Red Light District. In 1325, the oldest building in Amsterdam received a wood tower, which served as a bell tower, lookout post for approaching enemies and possible fires, and the city clock. In 1565, the tower received a new spire, and it was given a brick exterior in 1749. Soaring 220’ high, it contains four bells (Faith, Hope, Love, and Freedom). Before the introduction of street lighting, the bells would ring in the evenings to announce that, for the rest of the night, citizens were allowed in the streets only if they toted lanterns; those without lanterns were considered criminals. 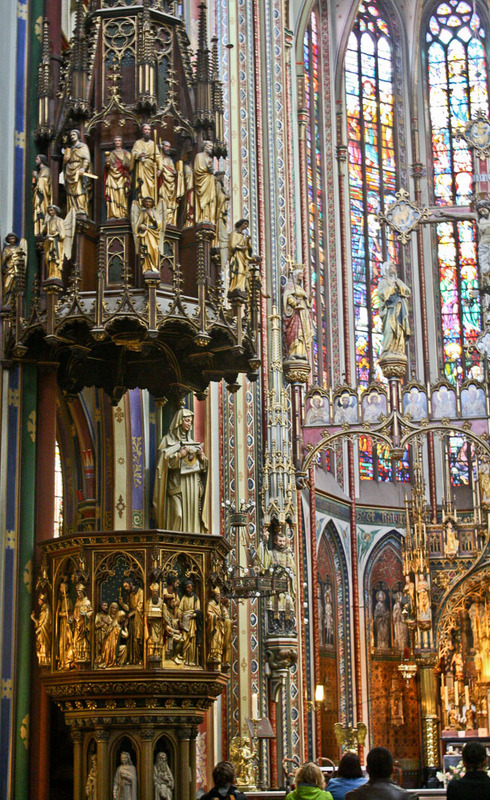 After the Iconoclasm, not many elements of the Catholic mass remained, other than the church itself and its windows. Religious extremists destroyed faces on Catholic statues or smashed them altogether, removed altars, painted over faces in paintings and frescoes, and stole or melted down the ceremonial silver. Upon entering this fantastic church, I was immediately awed by the stained-glass windows from the 15th and 16th centuries — huge, colorful, and tremendously detailed. A long ramble around revealed the spectacular organ (from 1726); the paintings on the vaulted ceiling (spared the destruction of the raging Protestants — they simply couldn’t reach them); the memorials and gravestones (about 12,000 people are buried in the church, under roughly 2,500 tombstones, the oldest from 1280 and the most recent in 1865, when indoor burials became illegal in the country); and the suspended model boats (donated in gratitude by sailors for a safe return to the city from the high seas) that are not only a nod to St. Nicholas, the patron saint of sailors, travelers, and Amsterdam, but also a reference to the concept of the “church as a ship,” guided by God and captained by St. Peter, and to the most legendary ship of all, Noah’s Ark. The pews of the choir — one of the oldest sections of the church, where the high altar used to be — feature charming medieval misericords, seats that could be folded out to give the choir the opportunity to rest during lengthy services. Most date from the late 1400s. On the underside of each seat is a carving — some purely decorative; others a sort of descriptive pictorial, like the two faces under one roof, signifying two people who agree on everything; two men in a fight, one representing anger, the other self-control; the indecisiveness of a man who can’t choose which of two chairs to sit on, so he remains standing. A beautiful oak screen from 1681 separates the choir from the rest of the church. 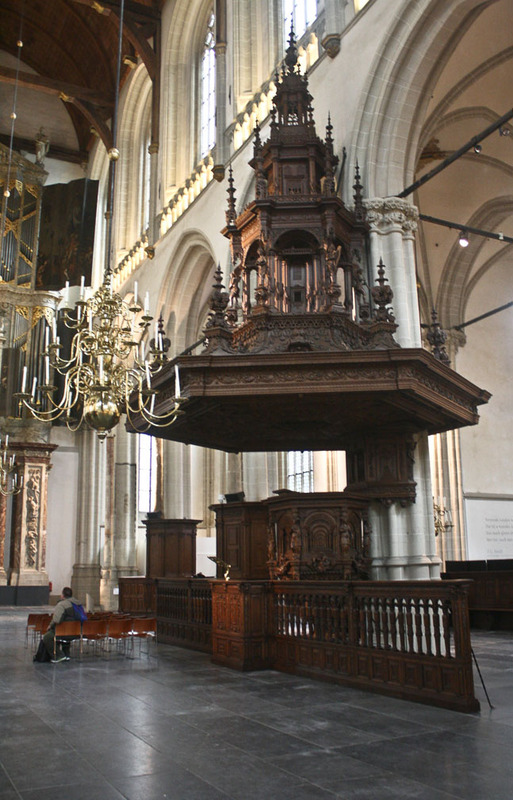 One side of the screen bears the Dutch words for “In order to keep religion and knowledge pure according to the word, one must no longer make unto thee any graven image.” That’s a direct reference to the defacing of statues at the time of the Alteration of 1578, when the pulpit (now nearing 400 years old), not the altar, became the focal point of the now Protestant church. Opposite the pulpit are nobility pews, where aristocrats and mayors sat. Due to the height of the pews, the occupants had a good view of the minister. 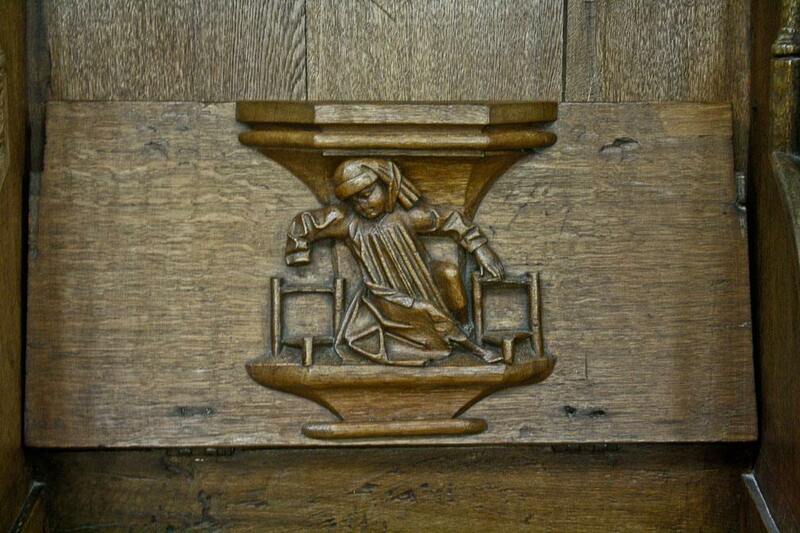 Because the sermons tended to be rather long, they often even had their own cushion to sit on. The less privileged, of course, had to lug their own chairs with them. In a corner of Dam Square, next to the Royal Palace, stands the tremendous New Church (Nieuwe Kerk), although “New” is a little misleading — it was built in 1410. But it’s newer than the Old Church, about a 10-minute walk away. Restored and beautifully decorated after the great fire of 1645, New Church no longer operates as a religious establishment (with the occasional exception of a coronation or royal wedding). Rather, it hosts special events, like the one I went to see — the World Press Photo Exhibition, with 150 photos, some of which were quite powerful, including Healing Bobby, a shot of a severely burned Iraqi war veteran who now earns a living as a comedian. The exterior is a riot of pinnacles and balustrades, Gothic windows, horizontal bands of brick, and a sundial way up top in one of the gables. The inside, however, is fairly plain, all the Catholic decorative elements swept aside and destroyed during the Reformation, when the Protestants took control of the country in 1578 and threw Spain out, renounced Catholicism and outlawed its public worship, and destroyed church altars and statues. But some elements remain, reminding me that this is no mere exhibition space: the grave slabs of the deceased (numbering about 10,000), some lovely stained-glass windows from the 17th century through 2005, the intricate brass choir screen, and the massive gilded organ (from 1655, it’s the largest historic organ in the Netherlands) that bears a resemblance to a classical temple. Perhaps the most arresting element is the fantastically elaborate wood pulpit with a positively tremendous and ornate sounding board topped by a three-tiered tower with half a dozen angels, one of whom holds the Ten Commandments while another plays a harp. I arrived in Amsterdam from the airport via train, and as soon as I emerged from Centraal Station (one of the world’s most beautiful train stations), I stopped in my tracks, taken aback by the magnificent Basilica of St. Nicholas (Sint Nicolaaskerk) just across the water. Flanked by slender five-story townhouses on either side, the basilica dominates the scene at this particularly active part of the city. Completed in 1887, the church, named after the patron saint of Amsterdam, was elevated to basilica status in 2012, making it the only one in the city. Due to its special architectural style, a combination of baroque and Dutch neo-Renaissance, the basilica is one of the city’s most important 19th-century ecclesiastical monuments. Two tall towers frame the dark-brown façade. Between them, a rose window features a sculpted bas relief of Christ in the center and the symbols of the four Evangelists at 12, 3, 6, and 9. Above the window, in a niche in the gable top, a sculpture of St. Nicholas watches over the city. Behind it all, an octagonal dome rises 190’, topped by a lantern and a cross. Inside, my eyes had to adjust to the unexpectedly dark interior, but once they did, I was enthralled. I took a seat to soak it all in, but the pew was curiously uncomfortable: The back rose only about a third of the way up my spine. So I walked around instead, awed by the size, the gorgeous dome, the largest 19th-century German organ in the Netherlands, the decorative side chapels and the two corner chapels devoted to Mary and Joseph, and the beautiful Stations of the Cross (which took seven years to complete, and whose artist chose parishioners as models for the figures). During a subsequent restoration, the even darker basilica had been given more light in the form of new stained-glass windows that, unlike the older still extant windows that portray a Biblical message or story for those who couldn’t read, have no particular theme, as literacy rates had risen. The fantastic murals especially caught my attention, particularly the highly curious Last Supper mural — only 11 of the 12 apostles are included: Apparently, Judas didn’t deserve a spot at the table when it was created. Wedged between the Singel and Herengracht canals, Francis Xavier Church is a study in extreme verticality and color — an unusual combination that makes it so memorable. This Roman Catholic Church, commonly referred to as de Krijtberg, replaced previous churches on the same spot. Its limited space, surrounded by houses on three sides, dictated the unusually tall design employed by the prolific architect Alfred Tepe (he built about 70 churches), who had to build up in order to allow enough natural light to stream in. Completed in 1883 but continually amended (the last stained-glass windows were added only in 1946), the neo-Gothic church features signature twin towers and a monochromatic brick façade with somber wrought-iron crosses atop the soaring spires and fences at the double-arched entry. The interior, however, explodes with striking colors that border on garish. Teal, violet, red, green, orange, yellow — just about every color is represented here, and not just in the stained-glass windows. You’ll find the entire spectrum in the arches and columns, in the corbels and groins, and on the walls and ceilings. Aside from its bold color palette, de Krijtberg’s upwards orientation marks this church for distinction. Everything seems to be elongated vertically, stretched a bit unnaturally to new heights. The arches, the columns, the windows, the confessionals, the organ, even the pulpit, all appear to be pulled heavenwards. 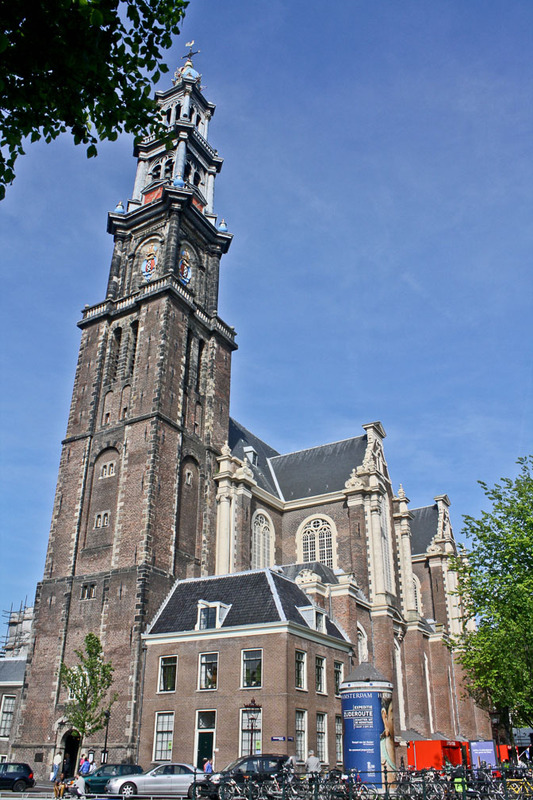 Constructed between 1620 and 1631, Western Church was the biggest Protestant church in the world at the time, and at 190’ long and 95’ wide, it remains the largest Protestant church in the Netherlands today. Inside, bright sunlight pours in from every angle via the 36 large windows (the light, fortunately, is not obstructed by any adjacent buildings), and the whitewashed inner walls make it appear even brighter. Large brass chandeliers hang from the groin vault ceiling, and a fantastically large soundboard over the pulpit ensures that the preacher’s sermon could be heard throughout this voluminous space. Until 1865, people were buried inside the church, the most famous of whom was Rembrandt, who was so poor when he died in 1669 that he was buried in an unmarked grave, with several other people. His exact resting spot remains unknown. Biblical paintings adorn the panels on the massive organ’s upper pipes, high above the entrance; those for the lower pipes have paintings of musical instruments. The organ is not original to the church. When Westerkerk opened, playing instrumental music inside a church was still considered “popish,” so the organ didn’t arrive until 1686. The tower, too, wasn’t part of the original construction, added in 1638. From various vantage points around the neighborhood, I could spot the tower soaring above the rooflines of the canal houses, like a giraffe above a treeline. Standing at 278’ tall, the tower is Amsterdam’s highest. Four red clock faces with gold numbering and hands provide a splash of color, as do the blue and gold urns; the red, blue, and gold city crests; and the blue and gold Imperial Crown of Austria of Maximilian I that tops the spire. The 51-bell carillon can be heard several times a day, played by hand by a group of volunteers from the congregation. That not only provides a mellow musical background to your stroll around the neighborhood, but it was also a source of comfort for doomed Anne Frank, whose house was just blocks away.